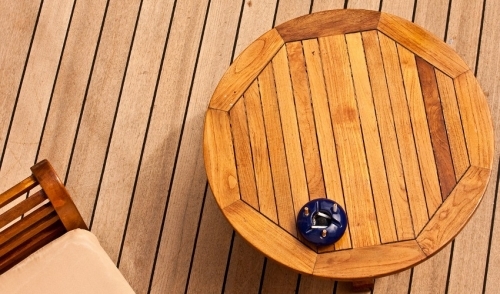 Share "Your Deck: Do-over or Makeover?" If your old deck is looking worn and shabby, you might be thinking it’s time to demolish it and start over with a newly designed deck. While that’s a perfectly reasonable approach, there are others ones that may better suit your need --and your budget. Depending on the condition of your existing decking materials, you can achieve dramatic results with a few small changes. First, assess your deck. Do you have a makeover candidate or is your deck doomed for replacement? If your deck is structurally sound, but is just looking a little dingy, a good cleaning can bring back quite a bit of eye appeal. Using one of the many chemical deck cleaners available today, you can literally wash away the gray weathered look from your deck. If the condition of the wood is a little too far gone for chemicals to remedy, consider pressure washing or even sanding. Be aware that caution should be used when pressure washing, to avoid stripping and damaging the wood. When sanding, be sure to go over the entire area first and check for nails or screws that are above the wood surface. Countersink any that your encounter, to avoid costly sandpaper tearing. If you’re still not satisfied with your results, there are a variety of pigmented sealers available that can transform the look of your deck in one weekend. Just like with the interior of your home, sometimes simply re-decorating will breathe new life into a living space. Consider adding flowers or greenery in strategic locations. A trellis is a great way to add character to your deck that can incorporate hanging vines and provide extra privacy. Paint the risers, rails and posts to coordinate with new deck furniture, add outdoor carpeting to match --let your imagination go wild! Within a fraction of the cost of replacing your deck, you can change the whole look of your outdoor living space. If your deck is structurally sound underneath, but the decking and rails are warped or splintering, all is not lost. As long as you’re still happy with the size and location of the deck, you can save yourself from future maintenance hassles by simply tearing up the old decking, rails and stairs and installing new, low-maintenance composite materials. To make sure your deck is a good choice for this type of remodel; verify that the footings are sound and not showing signs of heaving. This occurs when footings are to too shallow for the frost line in your area. The posts should be pressure treated and in good condition. Remember, if you plan on installing composite decking, the underlying structure of your deck should be able to withstand several more years of use! Sometimes, replacement is the only option. If Mother Nature has taken her full toll on you deck and the damage is too far gone, it may be time to rebuild. Make yourself aware of the many low-maintenance options available and be satisfied knowing that it won’t be so easy for her the next time. Remember, you can call on our friendly, knowledgeable staff to answer any questions you may have about your next deck makeover or do-over. We'll be happy to help you while deciding which materials and designs would best suit your needs.